When you get right down to it, you can turn almost any game into a birthday game. The list below is only a partial sampling of what we offer. For the more expaned list of games that kids love, check our index built especially for them. 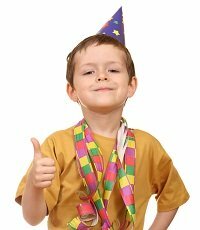 For more than just games, I like to check out the current birthday party ideas at Celebrations.com. Paying attention is hard for kids of all ages. Here is a good rule of thumb to remember: Kids attention spans usually only last about one minute for every year of their age. Remember that their minds are always racing, usually faster than ours! Choose your games from this list accordingly. Here's another tip I have found useful: Plan more games than you expect to use. If the kids start to wane playing one game, you have another one right up your sleeve ready to go. There are so many games on this site, and most of them would be great at a birthday party. Browse around the other catagories of games for a broader selection. Be sure to check out the Balloon Game page. It has several fun games for a kids birthday party. If your party is in the summer, you might consider some Water Balloon games. But there are many other sections from which you can choose kids games. And may I say...Happy Brithday!